History, as with so much else, has parts lost, elements known only by the traces left behind, stories yet undiscovered, and chapters properly told and known. Author Pricilla J. McMillan writes that a "much larger story "such as" anti-communist frenzy and political intrigue in Cold War America emerges more chilling than any fiction but can become forgotten at the public's peril. Fate here plays a role greater than relevance. Almost nothing worthwhile, for example, appeared in print on the Wright brothers until almost a century after they invented mechanical flight. Julius Robert Oppenheimer, however, has deservedly received notice in modern history. He led the wartime development of atomic weapons at the Los Alamos Laboratory. McMillan has reprinted her 2005 biography of him. Martin J. Sherwin, coauthor of the 2005 Pulitzer Prize winning American Prometheus, another biography of Oppenheimer, adds a foreword. McMillan in The Ruin of J. Robert Oppenheimer writes, "about how easily and brutally the government can crush an individual." Even more importantly, the author argues that, in the ultimate contradiction, "Oppenheimer's foes used deceit and treachery" "fueled by fear and paranoia" to end a chance for a world safe from the nuclear weapons they feared. 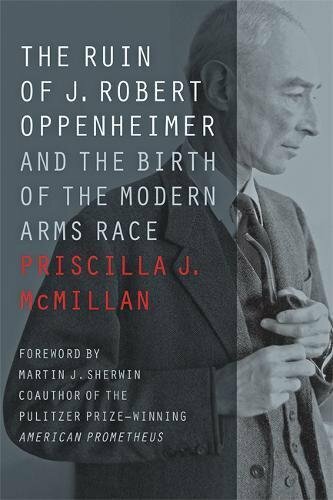 The Ruin of J. Robert Oppenheimer tells a chronological history of the actors in the early debate over civilian and military use of nuclear energy—Dean Acheson, William Golden, David Lilienthal, Edward Teller, and others. McMillan blames President Truman for "a disaster for everyone" by deciding to make every effort to overcome the seemingly insurmountable problems of building the hydrogen bomb. The author argues that Truman gave away the chance for negotiation with a post Stalin Soviet leadership and the opportunity "to level with the American people on a life-or-death decision." He thus "failed to buy security for the American people." The Soviet Union not only followed America's lead on building the hydrogen bomb but also drastically expanded its army. "There are stories like it today," the author writes without further comment. She might have observed that even now people who answer fear with facts and logic still risk of the moniker of "liberal" or even Communist, as if name-calling changes the truth. The Oppenheimer legacy serves more than as "a shameful and cautionary memory." McMillan argues that Oppenheimer's story is "an old one, the story of what happens when some institution—a church, say, or a government—decides to get rid of someone who has become anathema to it." Just as today's scientific community warns of global warming, scientists led by Oppenheimer argued against building the species level genocidal hydrogen bomb in the 1950s. As Sherwin explains, when the scientist dared argue that more nuclear weapons "would diminish our security," "a collection of conspirators" made charges "convoluted, inconsistent, and ultimately unsupportable in any unbiased form." Lewis Strauss, a stereotypical self-serving patriot "New York investment banker who was well connected in Washington," who "wanted as large an arsenal of nuclear and thermonuclear bombs as possible" led the conspirators "with an agenda of his own." He threatened national security by going "over the heads of others to the White House, the newspapers, and even to highly placed friends" as a self-serving partisan the kind of recklessness repeated to many times in American politics. McMillan writes, "without the suffocating effects of secretly, none of the events of the 1945–1955 decade would have happened in the way that they did and some would not have happened at all." "The public, which stood to be wiped out in the event of thermonuclear war, had been told nothing." Americans did learn that "the Soviet Union had run a successful spy operation . . . all through the war." Beyond that, "they knew nothing except that Russia had tested the atomic bomb." "The confidence of Americans was shaken" then to learn "that key parts of the government" "had been penetrated." Then "the security clearance of the nation's best known nuclear scientist, J. Robert Oppenheimer, had been suspended in the face of charges that he was a security risk." "If Oppenheimer was a security risk, did the United States have an important secret left?" The anti-Oppenheimer crusade came to include a galaxy of Cold War warriors including Dwight Eisenhower, Joseph McCarthy, and J. Edgar Hoover, like the public, driven by fear of the unimaginable stakes and anti-Communist indoctrination. It led to a government that needed scientists but "would not tolerate any of them challenging the morality of a new weapon." The Ruin of J. Robert Oppenheimer discusses what the author documents as the scientist's unfair treatment. "He was not accused of ever having given away a government secret." The scientist actually received praise for his common sense and discretion. The intelligence community repeatedly let down the American people throughout the Cold War. Oppenheimer, however, lived under close surveillance throughout his career and, on at least five occasions, he reported on students he suspected of being Communists. McMillan does lay out reasons for concerns about Oppenheimer's "glaring vulnerabilities, chief among them the possibility that he had been a member of the Communist Party." She did not write this book to defend the actions of the many enemies he made but does admit "he had a cruel streak" and "sometimes, for no discernible reason, he would lash out at a student, a colleague, even a powerful official, with an acerbity bound to humiliate." Contrary to what McMillan writes, this story no longer "stirs our consciences and makes us wonder what it is all about." Today's public has forgotten the Cold War and ignores the still very real and present danger of nuclear annihilation and the lesser danger of silencing truth. Pricilla J. McMillan understands that reality and, without patronizing the reader, writes an engrossing narrative that anyone with any level of background—or lack thereof—on this most important of subjects can follow. The author's writing might not meet some grammar guerilla's standard for perfection, but it works well. This well documented book includes appropriate biographical illustrations.